Small pistol but high capacity in the Springfield XD-MOD2 in 9mm. Springfield, XD-MOD.2 with GripZone, 9MM, 3" Barrel, Polymer Frame, Black Finish, Fiber Optic Front and Low Profile Combat Rear Sights, 2 Magazines, 1-13Rd & 1-16Rd. 3 EXTRA MAGS + RANGE BAG FREE! 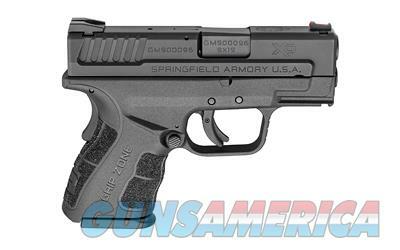 With the purchase of any new XD®, XD Mod.2®, XD-S®, XD-S Mod.2®, XD(M)® or XD-E® pistol October 1 - December 31, 2018 UPC Code: 706397899455 Manufacturer: Springfield Manufacturer Part #: XDG9801HC Model: XD-Mod.2 Model: XDG Action: Semi-automatic Type: Striker Fired Size: Sub Compact Caliber: 9MM Barrel Length: 3" Frame/Material: Polymer Finish/Color: Black Grips/Stock: GripZone Capacity: 16Rd Accessories: 2 Mags. Description: 1-16Rd,1-13Rd Sights: Fiber Optic Front & Low Profile Combat Rear Sights Subcategory: Pistols - Polymer Frame Before you bid make sure you can legally own a firearm and understand your state and local laws. Do not bid on this item if you cannot own it. Any return is subject to a 20% restocking fee. Payment and FFL are due within 7 days or we reserve the right to resell the item and will post you as a non-paying bidder. We accept Bank Certified Checks, USPS Money Orders, Visa and MasterCard. This listing is the Cash price. Please add 3% for credit card purchases. Shipping and handling fee is $35.00. Any questions you can call Don at Two Rock Technologies LLC or email Don. Please visit all our offerings on Guns America. We are a Service Disabled Veteran Owned Small Business (SDVOSB).